New York, July 29 (IANS) US stocks traded lower on Friday, as a selloff in the technology sector accelerated following weaker-than-expected quarterly earnings from Amazon. At midday, the Dow Jones Industrial Average ticked down 6.40 points, or 0.03 per cent, to 21,790.15. 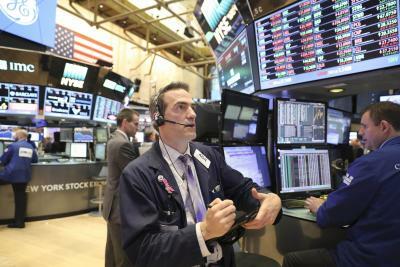 The S&P 500 lost 6.52 points, or 0.26 per cent, to 2,468.90, Xinhua news agency reported. The Nasdaq Composite Index shed 17.99 points, or 0.28 percent, to 6,364.20. Shares of Amazon fell around three per cent on Friday, after the e-commerce giant posted downbeat quarterly results. Amazon reported its net income was $197 million in the second quarter, or 40 cents per diluted share, compared with net income of $857 million, or 1.78 dollars per diluted share, in second quarter 2016. S&P 500 and Nasdaq pulled back from record highs on Thursday, as a selloff in technology shares weighed on markets. Analysts said the tech sector faced pressure as investors took profits off the table following upbeat earnings. Latest data from Thomson Reuters showed that the S&P 500 companies’ blended earnings in the second quarter of 2017 are expected to rise 10.8 per cent year on year, while the revenues are forecast to increase 5.0 per cent. On the economic front, the US economy grew at an annual rate of 2.6 per cent in the second quarter of the year, higher than the revised 1.2 per cent growth rate in the previous quarter, according to the first estimate released by the Commerce Department on Friday.